U-a-u. Podia não escrever mais nada e deixava a fotografia de um hambúrguer suculento convencer-te a experimentar esta receita, porque uau, uau! Costumava pensar que hambúrgueres e vegetarianismo ou pescetarianismo eram coisas de dois mundos diferentes, irreconciliáveis por natureza. Desde que optei pelo pescetarianismo comi dos melhores hambúrgueres da minha vida: Portobello marinado com guaca, Mahi Mahi e agora esta beleza. Suculento, cheio de sabor, com a textura certa e visualmente aquilo que se espera de um hambúrguer. Claro que ainda tem o benefício de não te deixar a sentir sonolento e pesado, mesmo que comas um double como eu. Vamos falar um bocadinho da beterraba, sim? Tenho 25 anos e não me lembro de ouvir nenhum dos meus amigos a cantar odes à beterraba, nem sequer me lembro de alguma vez ter sido referida como um ingrediente que era preciso comprar ou que alguém queria comer. No entanto, se mencionar beterraba à frente de alguém da geração dos nossos pais, eles adoram-na. Alguém devia estudar este fenómeno, a polaridade da beterraba. Comunidade científica, não precisam de agradecer. Ok, mas isto deixou-me a pensar. Os nossos pais estão neste mundo há pelo menos mais 20 anos do que nós, isto é malta que sabe. Sim, eles também gostam de mioleira e fígado, por isso não se pode confiar nos gostos deles a 100%. Passado uns dias, fui a uma festa e serviram salmão com salada de cuscus e beterraba. Eram bocados de beterraba e não beterraba ralada, para clarificar. E se vou ser completamente sincera, estava escuro e havia gins tónicos por todo o lado, por isso não reparei imediatamente na beterraba, limitei-me a atacar o salmão. Mas ali estava ela e eu soube que era um sinal do Universo, pura serendipidade. Lá fui eu comprar beterraba e em busca da inspiração certa, que encontrei nesta receita da Minimalist Baker, que adaptei. Toppings de hambúrguer à escolha - para mim foi pão, queijo gouda, alface e tabasco. Passar a quinoa por água corrente. Num tacho aquecer azeite e juntar a quinoa, fritando gentilmente durante 1 minuto. Juntar água, em dobro da quantidade da quinoa, e deixar cozer até evaporar, mexendo ocasionalmente. A quinoa cozida deve expandir e podes ver um rebordo ligeiramente solto. Escorre a quinoa num passador e afofa-a com um garfo. Pica a cebola e os cogumelos finamente. Usando um robot de cozinha basta pulsar algumas vezes, evitando que se torne uma pasta. Aquece um bocadinho de azeite numa frigideira e refoga a mistura de cebola e cogumelos, temperando-os com sal e pimenta. Num recipiente grande mistura os feijões com os cogumelos e a cebola e com um garfo esmaga-os, formando uma pasta mas mantendo alguma textura. Junta então a quinoa e mistura novamente. Adiciona a beterraba e os temperos e continua a misturar. Pica as nozes com uma faca ou pulsa-as duas ou três vezes no robot de cozinha. Junta-as ao preparado e mistura mais uma vez. Forma bolas com a massa preparada e espálma-as no formato de um hambúrguer. Eu fiz 8, um pouco altos, para ficarem mais suculentos. Distribui-os numa travessa forrada com papel vegetal e pincelada com azeite e leva-os ao frigorífico. Aquece o forno a 180ºC. Quando estiver quente, leva a travessa ao forno durante cerca de 40 minutos, virando-os a meio. A 5 minutos do fim, põe uma fatia de queijo por cima de cada hambúrguer e leva o pão ao forno. Prepara a iogonaise misturando com um garfo o iogurte, a mostarda, o limão, o azeite, o sal, a pimenta e a hortelã. W-o-w. I could just not write anything and let the picture of a juicy burger convince you to try this recipe, because wow, wow! I used to think burgers and a plant-based diet were things from different universes, clearly incompatible. Since I stopped eating meat I had some of the best burgers ever: marinated Portobello with guaca, Mahi Mahi and now this beauty. Juicy, finger-licking good, with the right texture and visually it’s what one would expect from a burger. As a bonus, it won’t let you feeling heavy and sleepy after you eat it, even if like me you go for a double decker. Let’s talk a bit about beetroots, ok? I’m 25 and I don’t recall any of my friends praising beetroots, ever! I don’t even recall it ever being mentioned as something we needed to buy (“oh and bring me two beetroots”, what?) or something someone was craving (“hmm I’m starving, do you have any beetroots?”, WHAT?). However, if I mention beetroots in front of anyone from my parents’ generation, say 50 plus, they start raving about it. Someone should study what certainly is a scientific phenomenon, the beetroot polarity. You’re welcome, scientific community. This got me thinking. Our parents have been on this earth for at least 20 years longer than us, these guys know stuff. On the other hand, they also like to eat brains and liver, so we can’t really trust them 100%. A few days later I went to a party and I was served salmon with a beetroot and couscous salad. I’m talking big chunks of beetroot, not just shredded beetroot. And, if I’m going to be completely honest, it was dark and there were G&Ts everywhere, so I didn’t immediately notice I was eating beetroot, I just went for it. But there it was and I knew it was a sign from the Universe, pure serendipity. Afterwards I had to go buy beetroots and while looking for some inspo, I stumbled upon this recipe from the Minimalist Baker, which I adapted. 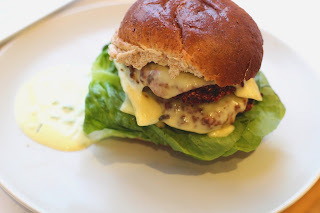 Burger toppings of your choice – I went with a wholemeal bun, gouda, lettuce and hot sauce. Rinse the quinoa over tap water. Heat the olive oil and sautée the quinoa for a minute. Add 2/3 cup water and let it cook until it evaporates, stirring occasionally. The cooked quinoa will look bigger and will have a loose border. Drain the water and fluff it with a fork. Chop the onions and the mushrooms finely. If using a food processor, pulse it just two or three times so it doesn't turn into a paste. Heat a bit of olive oil and sautée the onion and mushroom mix, seasoning it with salt and pepper. Put the mix in a big bowl and stir in the kidney beans, mashing everything with a fork until it forms a paste that isn’t too smooth, to retain some texture. Add the quinoa and stir well. 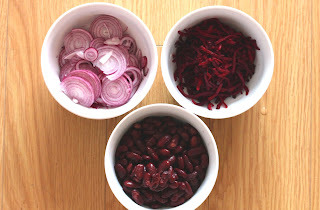 Lastly, add the beetroot and the seasonings, making sure everything is mixed together. Chop the walnuts with a knife or using a food processor just pulse quickly two or three times. Stir them into the bowl with the burger mix. Using your hands, form balls the size of a big meatball and flatten them into a burger shape. I made 8 thicker ones, to make sure they’re juicier. 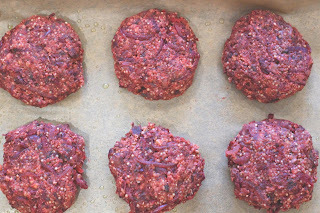 Lay them on a tray covered in baking paper brushed with olive oil and refrigerate them. Heat the oven to 180ºC and bake the burgers for about 40 minutes, turning them around halfway through. Just before they’re done, put the bread in the oven and top the burgers with the cheese. Prepare the yogonaise by mixing the yogurt, mustard, lemon, olive oil, salt and pepper with a fork and then stir in the peppermint.